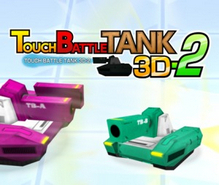 Touch Battle Tank 3D 2 was delisted from the Nintendo 3DS eShop in North America in May of 2018. According to a Wikipedia discussion started by user Kristie Ann Webb this is when several 3DS titles published by Agetec were removed from the eShop. Many of these titles remain available in Europe as of this writing where they were also published by Agetec. This indicates a possible closure of the company which hasn’t released a new title since 2016 and whose website and social media accounts have been dormant for just as long. As such, it is likely that the European versions of these games will be delisted at some point. Meanwhile, several of the titles remain available in Japan where they were released by publishers other than Agetec. “3D Tank Battle Action Returns! This time, there are two types of tanks–the attack tank with its powerful offensive capabilities, and the defense tank with its impregnable defenses. The attack tank improves upon the original charge shot with the ultimate weapon–the super charge shot. It cuts a swath of devastation through any armor. The defense tank features a shield that bounces back any attack. The hostiles have added new weapons like wave shots, scatter shots, lasers, and drills. Hover units unaffected by the terrain and a cloaking stealth system have also been added. Gargantuan tanks have also joined the enemy’s forces. The original’s weapon systems are back too, like ricochet, homing, and mortar-type shots.